Current website designs typically do not include sign language interpretation for deaf people. As a result, many deaf people lack access to critical information on the internet. A pilot study gathered input from deaf adults in one community to identify designs providing best access to information on the internet. 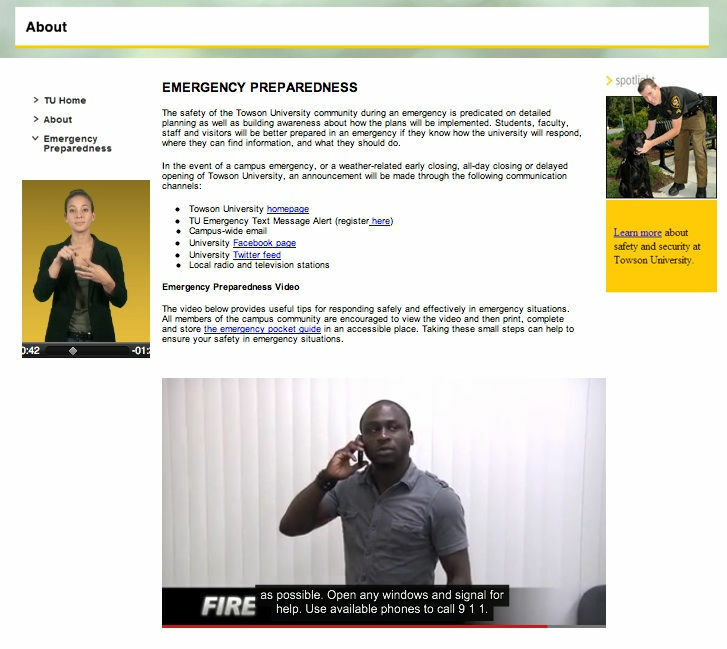 The study included four different web design choices: (1) English text, spoken English, and captions; (2) shadowbox-format interpretation of print text and embedded signed language interpretation of video action; (3) thumbnail-sized sign language interpretation of video action; and (4) thumbnail-sized interpretation of the printed text and embedded sign language interpretation of the video action. A mixed research design was used. After demonstrations, deaf participants were surveyed and interviewed to identify which web designs were the most welcoming and provided the best opportunity for comprehension. The outcome suggested that deaf participants relied on signed language interpretation of the text to understand the message and favoured those designs that provided the most comprehensive access. This study provides support for further exploration of new designs incorporating the concepts of Universal Usability that will allow deaf people to fully access the internet. Keywords: Universal Usability, deaf people, signed language, technology, accessibility, webpage design. Over the past two decades, use of the internet for obtaining and sharing information has become an inextricable part of daily life for most westernised countries. Unfortunately, some groups face challenges accessing this information even though the technology is readily available. As one example, deaf people in the United States and Canada comprise an extended community that does not have easy access to information presented on internet sites and broadcasts. This challenge applies to both spoken language, which they do not hear, and written language, which is based on a foundation of spoken language and is not the first language of many deaf people. Whereas blind people gain access to information through the use of Braille output, enlarged print and synthesised speech, deaf people require a parallel accommodation in a visual mode. This is most effectively accomplished through the use of American Sign Language (ASL), a complete language different from English with its own phonology, morphology, syntax, semantics, and pragmatics (Valli et al., 2011: 13). There is a cohesive deaf community that shares common experiences, values, and a culture that values and depends on ASL (see for example Padden, 1980: 90; Padden and Humphries, 1988: 2–5; Rutherford, 1988: 186–89). People within this deaf community consider themselves as a cultural and linguistic minority that includes ethnic-like qualities (Charrow and Wilbur, 1989: 103–05; Eckert, 2010: 317–19; Johnson and Erting, 1989: 43–44; Lane, 2005: 291; Lane et al., 2011: xvii–xix; Reagan, 1985: 272–73; 1995: 240), and not as a disability group. In fact, Supalla (2014) proposed that the deaf community exemplifies the concept of a 'disability-free' model, focusing on the person regardless of physical or mental differences. The concept of disability is often characterised by a negative connotation, implying broken or unable, such as a 'disabled vehicle.' However, many individuals with so-called disabilities live active and normal lives, often using alternative techniques to achieve the same results as people without disabilities. Research studies on deaf people's reading achievement in English have demonstrated that, on average, deaf individuals are most likely to read at a 4th grade level upon graduating high school (Holt, 1993: 173; Traxler, 2000: 342). Fluency in a spoken language provides major benefit in learning to read and write the language (Lonigan et al., 2008: 61; Storch and Whitehurst, 2002: 934). Thus deaf people, who do not hear and process spoken English, are not likely to be able to readily access conventional reading practices. Even though deaf individuals may learn to read English as a second language, many still experience reading difficulties due to the complexity of modality differences (see for example Mayer and Wells, 1996: 96; Musselman, 2000: 9; Padden and Ramsey, 1998: 33–34). For this reason, written English captions or written English text overall may be insufficient for providing full web access for the deaf population. In addition to captions that provide access to some individuals, the inclusion of ASL interpretation is critical to provide access to those people who do not have access to English. Universal Usability is a concept that promotes assimilating the needs of a broad spectrum of users in the designing of technology without barriers to allow all types of people to have access to services, products, and information that are found on the web (Bergman and Johnson, 1995: 87–89; Cooper et al., 2012: 1–2; Meiselwitz et al., 2009: 215–16; Richards et al., 2013: 5). Accessibility in the production and planning process of initial web page designs provides easier user interfaces than retrofitting. The goal of the pilot study described in this article was to show that addressing the needs of the deaf population by including signed language in a way that meets their needs can remove many communication barriers for people who sign. Universal Usability (UU) is the process of designing systems not only to make technology more accessible, but also to make them more practical for a larger and more diverse community of users. As technology has become more omnipresent, UU satisfies the need to incorporate diversity into the functionality of the web design from the start. This process implies that instead of adding considerations at the end as an afterthought, web design should be developed to provide access to all during the creation process (see for example Horton, 2005: 6–7; Keates, 2009: 5–12; Keates and Clarkson, 2003: 215–16; Law and Vanderheiden, 2000: 123; Newell and Gregor, 2000: 43; Shneiderman and Hochheiser, 2001: 367–68). Guidelines and research for UU strive for improved multimedia interfaces using technology such as enhanced closed captioning and signed language interpretations for those who are deaf and have trouble reading English, but these methods have not yet become entrenched in current web design (Braffort and Dalle, 2008: 393–94; Brashear et al., 2006: 79–80; Cooper et al., 2012: 19–36; Richards et al., 2013: 28–29). are accessible for all regardless of the user's body size, posture or mobility. UD is a social movement, based on the understanding that the design of everyday life overlooks body complexity and is rarely sensitised to cognitive and physical impairment (Imrie and Luck, 2014: 1315–17). UD attributes the disabling of society members who fail to approximate a normalised body to social and cultural values and attitudes. Successful UD can liberate people from disabling design and enhance their autonomy (Sanford, 2012 as cited in Imrie and Luck, 2014: 1315). For example, many people use computers to access information electronically, including those with different levels of training and education, users with disabilities, very young people, and very mature people, all of whom would benefit from application of these seven principles. Providing access to technology for the diversity of average users is essential when making technology easier for deaf people, people with disabilities, and even easier for those without disabilities (Bergman and Johnson, 1995: 88). Comden and Burgstahler (1997: 1) and Rose et al. (2006: 1–2) stressed the same concept to emphasise the importance of making webpages and learning environments accessible to users and individuals with a range of disabilities, ages, and languages other than English. Addressing this matter of disability access, the Americans with Disabilities Act requires an option for including captions on any video found on a webpage (Comden and Burgstahler, 1997: 1–2). This guideline implies that captioning is helpful for deaf people in all settings (home, work, education, etc.) because it gives them equal opportunity to readily obtain information. Federal guidelines imply that use of captioning provides sufficient access, but in fact captions do not provide true usability for all deaf people. The fact that federal guidelines focus on captioning as the consummate accommodation for deaf people, with no discussion of signed language, indicates that the accessibility issue for deaf individuals has not yet been sufficiently addressed. because sign[ed] language provides the ability to provide intonation, emotion, and other audio information that is reflected in sign[ed] language interpretation, but not in captions, sign[ed] language interpretation provides richer and more equivalent access to synchroni[s]ed media. This indicates the importance of having signed language accessibility for deaf people to eliminate barriers of language while obtaining information from the internet. Unfortunately, these guidelines are just suggestions to follow when creating websites for the public, and more widespread implementation is needed to ensure accessible web design. The ability to use ASL in other forms of technology has increased in recent years (e.g., webcams, YouTube, and videophones). Keating and Mirus (2003: 699–700, 712) review the benefits of this technical movement and its impact on the deaf population. In their study, they found that the use of video technology does, in fact, influence on how deaf people express and receive information through the use ASL, giving deaf people effectiveness and clarity of interactions and communication. Similarly, Zazove et al. (2004: 379–80) found that younger deaf people who use computers and the internet more regularly preferred ASL interpretation and text captions combined, and expressed that the overall experience was enhanced when watching videos with ASL interpretation. More recently, Yoon and Kim (2011: 284–87) conducted a study with college-aged deaf students on the effects of captions and Korean Sign Language interpretation in terms of cognitive load, comprehension, and motivation in learning. Based on the literature on deaf people's interaction with computers, Yoon and Kim, in their study, combined signed language clips along with captions for online learning to ensure that deaf students received information from sources in an effective manner. They found a positive effect on deaf students' learning overall with the use of both signed language clips and captioning which had no effect on cognitive load. Both of the studies described suggest that deaf users significantly prefer websites that include sign language interpretation, and that their comprehension is greater when sign language interpretation is provided. The study described in this paper builds on the previous two studies by addressing deaf consumer satisfaction regarding the physical design and layout of the web page, looking at deaf people's preferences regarding location and size of the interpretation. An existing example of sign language incorporated directly into the web design can be found on the website of the Canadian Cultural Society of the Deaf which represents deaf people and their arts in Canada. This website provides the viewer with the opportunity to select between four options, two signed language choices and two printed language choices (ASL, Langue Signed de Quebecois, English, and French; http://www.deafculturecentre.ca/Public/index.aspx), to ensure access and comprehension. The authors of this study chose to maintain and display the original English text to ensure accessibility for all; thus, the focus of this project is the incorporation of ASL interpretation with print and spoken English. Which web design presents a clear and preferable design for deaf viewers? How does the inclusion of an ASL interpretation for English text on a website design affect deaf participants' comprehension and accessibility? Responses to these questions were critical to understanding the effectiveness of web designs for the deaf population. These answers also explored the UU concept and its role with internet accessibility. In order to ascertain preferences and comprehension, four distinct web designs were developed that included captioning and/or signed language interpretation. Participants viewed these web design samples and provided feedback on each design regarding its ease of use, appearance, and comprehensibility. The university's Institutional Review Board approved this study. The study participants were deaf individuals in a mid-Atlantic region of the United States. Twenty-one participants ranged in age from high school graduates to mid-70's. All were fluent in ASL but varied in the ages at which they learned it, from birth and having deaf parents, to learning how to sign when they attended school or college. For this research, participants were recruited in several ways including flyers and personal contact with local people in the deaf community. Contacts were made using videophone calls, email distribution, iPhone video messaging and personal face-to-face contact. All participants who met with the student researcher were local residents who viewed four sample website designs created by the student researcher. 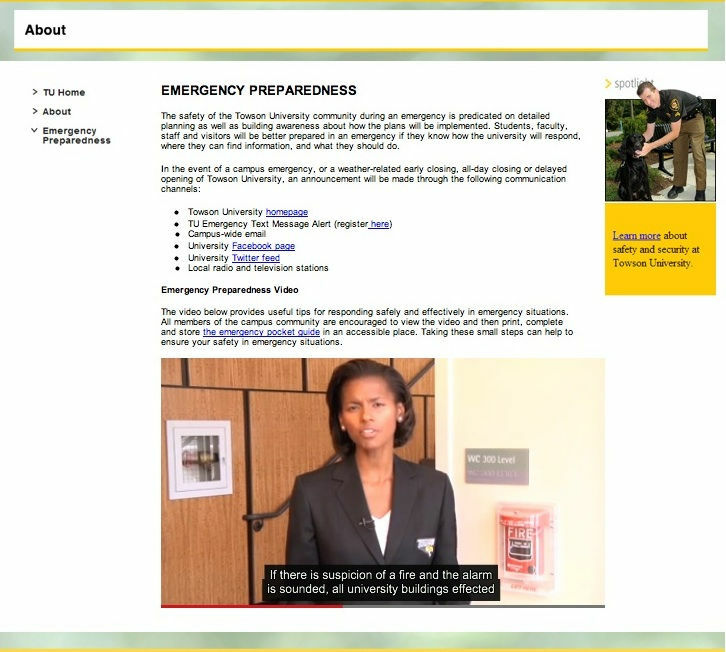 All website designs were derived from the same web page titled 'Emergency Preparedness' and were modified for each design. The first design (A), shown in Figure 1, provided English text with a spoken video and text captioning in English, the format currently used by the university. All of the designs included English text captioning located at the bottom of the video that could be turned on and off. 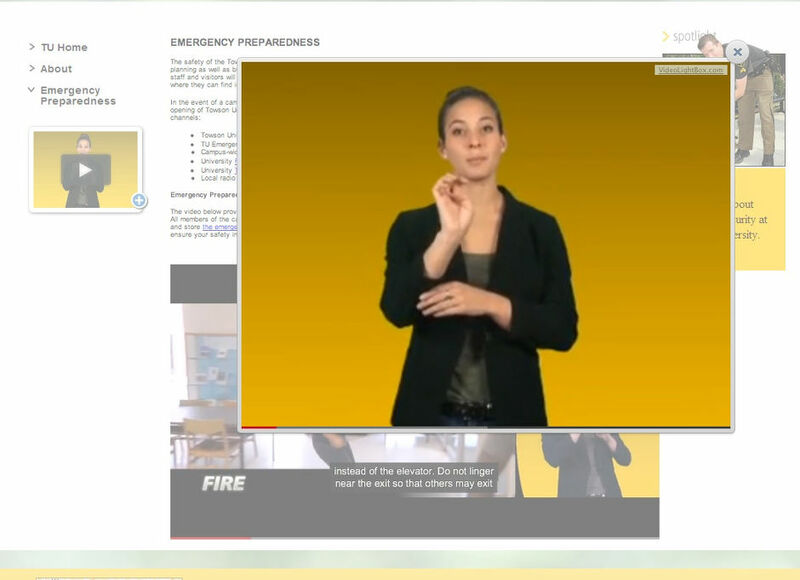 The second design (B), shown in Figure 2, used the same Emergency Preparedness website as the first but included two opportunities for the viewer to receive information through ASL. First, there was an ASL interpretation of the print text located in the left column. If clicked, the thumbnail-sized ASL video expanded to nearly full-screen size in the format of a shadowbox and covered the English text. Second, on the right-hand side of the demonstration video below the text on the original web page, an embedded video of an ASL interpreter provided all viewers with a full ASL interpretation of the spoken dialogue, along with on-screen captioning. The third design (C) also used ASL interpretations for the English text at the top of the screen but the small thumbnail located on the left column beside the English text could not be expanded to the full-screen size. This design can be viewed in Figure 3. The ASL video interpretation of the spoken dialogue was in the same thumbnail format that started automatically once the English text translation was complete. 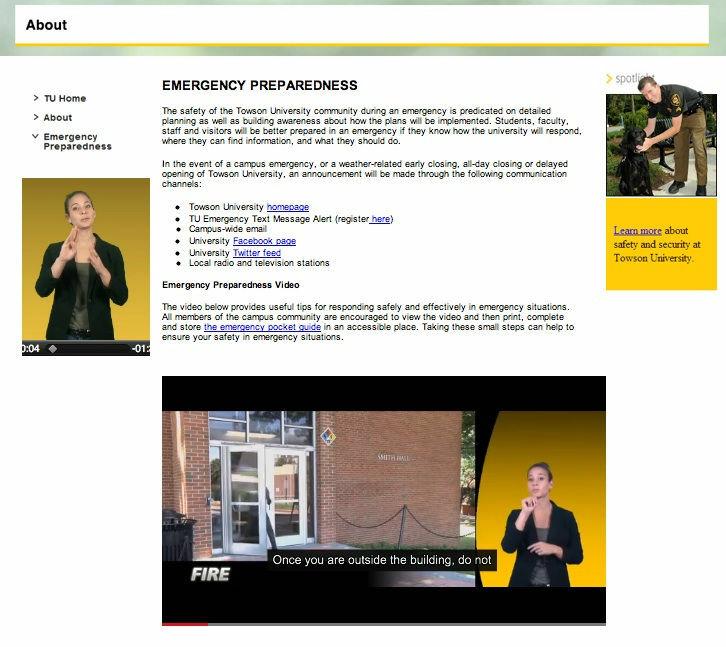 The final design (D) shown in Figure 4 also included a thumbnail ASL interpretation located on the left column but did not interpret the video below after the text interpretation was complete. Instead, the video located under the text came equipped with an embedded ASL interpreter on the right side of the original video similar to Design B (Figure 2). Each participant was surveyed through the use of ASL by the student researcher and each participant's responses were videotaped for data analysis. These videos could be reviewed and organised within a format that would allow for comparison. The full list of interview questions can be seen in the Appendix. Each participant was to observe all four web designs shown above. Participants were required to read and review Design A first, then respond to the first few questions of the survey including simple demographic questions (e.g., age, gender, age of ASL acquisition). The researcher also asked two additional questions regarding the comprehension of information in the English text and video clip in Design A. A series of one-minute clips from an eight-minute video were used, so that comprehension would not be impacted by having already viewed the content. The comprehension questions about Design A were asked before the ASL interpreted designs were shown (i.e., Designs B, C, and D). This part of the study attempted to identify the participants' comprehension while reading English texts without any ASL influence. After the first few questions were asked, the student researcher guided the participants to observe the format and features of Designs B, C, and D. Once completed, the researcher repeated the survey questions in ASL regarding all of the designs and the participants' reactions to each web design based on visual appeal and accessibility. Questions to assess content comprehension were asked via ASL after participants had viewed each design choice, and were coded by the student researcher as 'understood' or 'not understood'. A design size of twenty-one individuals ranging in age, education level and age of ASL acquisition comprised this mixed method design study. The data analysis included the demographic background of the participants as well as quantitative responses based on a Likert scale (i.e., 1 to 5 from 'lousy' to 'excellent') of choices between Designs A, B, C, and D. A third part of the analysis included qualitative open-ended questions. The qualitative information from each participant was categorised by similar key word phrases and text comprehension (ASL interpretation v. written English), which were also tallied. Cross-tabulations were used to analyse the interactions of specific variables involved (e.g., correlations between an individual's level of education and their inclination towards language modality; signed language (ASL) verses written English). Only descriptive statistics were used since no tests of significance were appropriate with the small sample size. The study participants were twenty-one deaf individuals from the local area, in the mid-Atlantic region, including ten females (47.62%) and eleven males (52.38%). Participants ranged in age from high school graduates to mid-70's. Eight participants were 20–40 years old (38.10%); eight were 41–60 years old (38.09%); and five were 61–80 years old (23.81%). All were fluent users of ASL but differed in the ages at which they learned it, from ten native signers (47.62%, born deaf and having deaf parents), to those who learned how to sign when they attended grade school or college. Five participants acquired ASL between the ages of 5–10 years old (23.81%), and six acquired ASL between the ages of 11–20 years old (28.57%). Participants also differed in levels of education. Six had earned a maximum of a high school diploma (28.57%), six had earned a maximum of an Associate's degree (28.57%), two held Bachelor's degrees (9.52%), and seven held Master's degrees (33.33%). Regarding ethnic backgrounds, thirteen identified as Caucasian (61.90%), three identified as African American (14.29%), two identified as Latino Americans (9.52%), two immigrated from Russia (9.52%), and one immigrated from Africa (4.76%). Table 1 shows that most participants in this study opted for Design B (n=13) as their first choice for design with Design D (n=10) as the second most popular choice. Four of the participants rated Design A (English only, no ASL) as 'lousy' whereas none of the designs incorporating ASL (Designs B, C, and D) were rated 'lousy.' Design B was perceived as the most welcoming choice (n=12), only slightly better than Design D (n=11). However, Design D received higher ratings for being most complete and accurate (n=14) as compared to Design B (n=10). Paired t-tests were used to compare mean ratings of each of the ASL designs with Design A. Ratings of Designs B and D were significantly higher than Design A (respectively, t=6.64, p<0.0001; t=7.86, p<0.0001). The rating of Design C was not significantly higher than Design A (t= 1.91, p=0.071). Tests had 20 d. f. and the overall result is: t=6.81, p<0.0001. Participant responses to the question 'What do you like about this design?' can be seen in Table 2. All qualitative responses were grouped into categories (clarity, use of ASL, size, pace of signing, etc. ), separated into larger categories of 'like' and 'don't like' and tallied. Design D received the most ratings for web design features that participants liked. Participants commented that it was easy to use, provided many options, and had ASL/English accessibility. Contrary to Design D, Design A received the lowest ratings with the last number of 'likes'. The fact this design was shown and rated first, before other options were revealed, may explain why one participant stated that the design was 'good' and five acknowledged that this design was familiar because they are used to closed captioning. Design C received the highest number of comments implying dislike. Feedback from participants included that the size of the ASL interpretation was too small (thumbnail size), and they found it difficult to view both the original video and ASL interpretation simultaneously. Design D received the lowest number implying dislike, the small size of the ASL interpretation thumbnail used for the text was acceptable because it allowed viewers to simultaneously view the printed English text. * Some participants answered more than once based on different reasons and web design features. * Not measured since content was already revealed in Design A and B. Also included in Table 2 was a measure of the participants' comprehension while reading the English text only (Design A) and viewing the video of ASL interpretation for English text (Design B). This was measured by each participant's ability to summarise what he or she read or viewed. Data in Table 2 shows that the participants understood more information when the ASL interpretation was made available. Based on the sample design, the last part of this table shows the comprehension of video content. Most participants (n=19) demonstrated that they understood Design B, with the interpreter provided for the video content, by their ability to summarise the content presented. Design D ranked second with eighteen participants understanding its content. Both designs included embedded role-playing in the stimulus videos with added ASL interpretation, with the only difference being the ability to enlarge the size of the ASL interpretation for the English text in Design B. Conversely, Design A was least understood, where the participants had to obtain information from the video by reading captioning in English text, with only eight out of twenty-one participants being able to summarise the content correctly. Table 3 shows the average ratings for the four designs on a scale from 1 to 5 based upon demographic variables including gender, age, age of ASL acquisition, and level of education. Due to the small sample size, no statistical conclusions can be made, however, discussion of this data is warranted. Regarding gender, there appeared to be a slight difference between females' and males' preferences. Both males and females rated Designs B and D highly. However, the females in this study rated Design B highest (average = 4.5) while most males rated Design D as most preferred (average = 4.6). Similarly, participants with different ages opted for Designs B and D. The only difference between the 41–60 age group and the 61–80 age group was that the former group preferred Design D (average = 4.3) as compared to the latter group who chose Design B (average = 4.8). There was no difference based on age of ASL acquisition among participants, as all of them opted for Design B and D. Regardless of educational level, all participants selected Designs B and D as the best possible options. Overall, the cross-tabulation data suggested consistency in the preference for Designs B and D and the lowest for Design A. Based on the quantitative, qualitative, and cross-tabulation data, Design B and D were the most preferred options, despite the fact that Design A (text in English only) is the design most used worldwide. In response to the initial research questions, the webpage layout of Design D provided the preferred format for deaf viewers, based on positive responses to the simple and effective usability of the webpage and the high rate of comprehension. The presence of ASL interpretation, in addition to captions, for both spoken and written English on-screen messages, provides access to information for deaf individuals who sign without any barriers. As for visual appearance, Design D appears to be the favoured option among participants due to the simplicity of the webpage format, and inclusion of ASL interpretation for both text and spoken video. Most participants said that Design D was easy to use and offered many options regarding accessibility to understanding English text and the ability to view ASL interpretations simultaneously. Participants' comprehension was measured based on whether or not they understood the content of the information on the website. The participants better understood the content when the option of ASL interpretation was used. Across all demographics in this study, the options presenting as much ASL interpreting as possible were preferred and provided the greatest opportunity for comprehension. Equitable use; for example, providing the same means of use for all users and avoiding stigmatising or segregation while obtaining information which applies to use of different language modalities (i.e., signed versus spoken) upon web access. Flexibility in use; for instance, providing a choice in the method of attaining information which means having options such as captioning, signed language interpretation, and Braille compatible software built into a webpage that could either be utilised according to a person's individual preference. Perceptible information; which includes using different modes of information presentation (signed video, spoken, and tactile) and compatibility with a variety of techniques or devices used by people with sensory limitations. Universal Design is committed to social justice for everyone by providing the means for everyone to interact with the environment in ways that are sensitive to individuals and groups of people's varied needs within society. UD is a dynamic social movement that attempts to include everyone across a range of social and geographical scales, industrial sectors, and governance regimes (Imrie and Luck, 2014: 1318). The findings of this study lead to suggestions for new concepts in web design that satisfy the needs of all people without discrimination. The addition of sign language interpretation enables access for deaf people without negatively impacting other users. To date, the implementation of UD has not totally met the needs of deaf people. With adequate access, deaf people have the opportunity to be active contributors to society. Without access, there is the risk that instead, deaf people could become isolated from society. A movement called DeafSpace, rooted in architecture and promoting deaf-centric design (Edwards and Harold, 2014: 1357–58), has attempted to meet the needs of deaf people. It has made valuable contributions to the field of architecture in regards to space free of barriers for deaf people. However, Edwards and Harold identify that this is somewhat of a political issue, whereby space is designed for the targeted benefit of deaf people without considering benefits to society at large. To bridge this gap, the concepts promoted in this paper suggest a paradigm of UD and UU that would not advocate separate types of access for deaf and hearing people, but rather one design that can be accessed by all. In the spirit of UD, the widespread implementation of ASL at the initial design level incorporates Universal Usability ensuring that everyone, regardless of hearing abilities, has equal access in obtaining information for learning, computer and human interaction, and technology. Although this study was small in size, its results justify further exploration of new website designs that promote access for the deaf community. Findings from this study may reveal the importance of integrating accommodations into the initial design of the technology rather than retrofitting designs using additional resources. Including sign language interpretation during the design and production phase will be more cost-effective and time-efficient than attempting to redesign websites with interpretation added later, or hiring individual interpreters to provide website interpreting services to individual consumers across the country. The federal guidelines, cited above, exist; it is now the responsibility of web designers across the country to obtain input from members of the deaf community. Accessibility for deaf people through both captions and sign language interpretation must be implemented and enforced, just as access is provided to blind users through Braille output, enlarged print, and synthesised speech. This study provides an important step in understanding the current lack of accessibility that deaf individuals experience regarding webpage content and design. Next steps include additional research with larger samples of deaf people providing input on preferred designs, enforcement of policies from the federal level, and mandating the provision of ASL for all websites. The authors would like to acknowledge Drs Elizabeth Berquist (Towson University) and Jonathan Lazar (Towson University) for providing feedback on this article, Joel Resiman (Veterans Administration) for his assistance with the statistical aspect of this study, and Robert Cave (Towson University) and Joseph Perkins (Towson University) for designing the web pages. Erika Murray completed her B.S. degree in Deaf Studies from Towson University, Towson, MD and is currently Video Relay Interpreter at Sorenson Communications, Inc. as well as freelance ASL interpreter throughout her community. She is planning to pursue her graduate studies in integrative health and wellness in the future. Jody H. Cripps is an Associate Professor of Deaf Studies at Towson University, located in Towson, Maryland. He received double B.A. degrees in Sociology and Deaf Studies from Gallaudet University, an M.A. degree in Signed Language Studies from the University of Arizona, and a Ph.D. in Second Language Acquisition and Teaching from the University of Arizona. His areas of expertise include Universal Design, the Whole Community, social responsibility, applied linguistics, and literacy. He is a member of the Society for American Sign Language. Sheryl Cooper is an Associate Professor and the Coordinator of the Deaf Studies program at Towson University. She earned her Ph.D. from Gallaudet University, her Master's degree from New York University, and her Bachelor's degree from the University of Pennsylvania. She is a member of many national and local professional and consumer organizations in the Deaf community. Her research interests include the academic status of American Sign Language on college campuses, and Service-Learning in the Deaf Community. Matthew Wynd is a technology support director at Towson University in Towson Maryland. His workgroups support the campus community in the use of technology for teaching, learning, working and living. His professional background includes digital media development, service development, and digital accessibility. 1. How would you rate the design of the first website sample that you viewed? 5. How would you rate the design of the second website sample? 9. How would you rate the design of the third website sample? 12. How would you rate the design of the fourth website sample? 17. How are these sample webpages different from what you have used before? Supalla, S. (2014), 'A Hard Look at the Concept of Disability Studies', Paper presented at Deaf Studies Today conference, Orem, UT, 9–12 April 2014. To cite this paper please use the following details: Murray, E. et al (2015), 'Internet Access Through American Sign Language: A Pilot Study of Innovative Web Designs', Reinvention: an International Journal of Undergraduate Research, Volume 8, Issue 1, http://www.warwick.ac.uk/reinventionjournal/issues/volume8issue1/murray Date accessed [insert date]. If you cite this article or use it in any teaching or other related activities please let us know by e-mailing us at Reinventionjournal at warwick dot ac dot uk.